Stephen graduated in 1995 and joined the practice in 2012. He is a skilled team leader and talented designer, and his work includes buildings for education, leisure, offices, healthcare and housing. He has a keen focus on Energy Efficiency, qualifying as a BER Assessor in 2009 and currently undertaking an MSc in Building Performance. 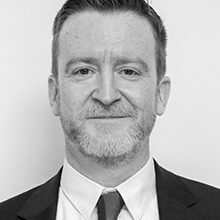 Stephen’s current workload includes multiple Education projects in Ireland and the UK, and several medium and large-scale Residential schemes.